– as he fumbles and he’s rumbled! Even the microphone was not his friend; it would seem. It was getting so repetitive that a “break” was needed to let the man sort himself out. The fact is that knowing the role of Samura Kamara in the destruction of our country, even if he had been given ten new microphones from the best furnaces of a Beijing factory that question would have been very bitter for him to chew. Stop wondering, reader: corruption does have some very “positive” aspects. All you need to do is to compare the glossy lifestyles of the tolongbo kingpins with the rocketing hopelessness gripping the majority in our country, and then you may begin to understand why Mr. Kamara decided that corruption has some very “positive” effects that must be allowed to flourish! Those were the exact words from Mr. Samura Kamara. The controversial PPI claimant who was recently SELECTED by president Ernest Koroma in what many Sierra Leoneans see as an insidious attempt to create personal insurance against the potential whippings that could follow anyone who has lived a corrupt existence in a land pulsating with so much suffering and deprivation. Samura Kamara made this unconscious admission in a string of fumbles that is bound to dampen further the soaked spirit of APC supporters many of whom had long given up any hopes for State House from the minute Mr. Kamara was “anointed” in that very dodgy Makeni convention. Stretching his arms and looking straight in the direction of the moderator, like a man who wants to declare his unfitness to rule, Mr. Samura ventured what is very well the headline of the entire debate: “I blame the government”! The Tolongbo Ph.D. claimant was responding to a question that referenced an illustration he had brought up about a particular sad scenario he alleges to have witnessed somewhere in the rural areas as he tried to bolster a point about the suffering condition of the generality of Sierra Leoneans. “I blame the government” was the unequivocal reply. Ordinarily, the truism in that statement is so obvious that it shouldn’t ruffle the wing of a fly slept peacefully because every sensible person knows that we should squarely blame this ten year “APC TOLONGBO” for the deluge of deliberately manufactured negatives that have sunk our country to the very neck. Yes, you got that right: “MANAGED the affairs of the country for 40 years”! The question then naturally arises: who is Samura Kamara blaming here for the cruising corruption, the galloping inflation, the deplorable condition of our people and the abysmal failure of leadership? What I sense here is not so subtle an attempt to distance himself from his political godfather and the party of the searing Sun. Call it a doomed sprint towards a “rebranding” theatre. 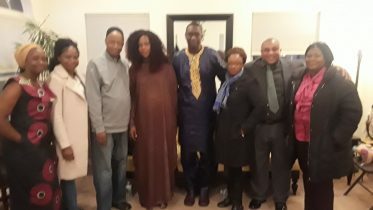 It is possible that “team Samura” may be talking to his Nigerian “image makers” without letting President Koroma on some of the secrets of how far the Nigerians would want him to break out of the damaged EBK/APC political SHELL. Call it “EBK/APC POLITICAL CELL”, if you want to be more appropriate! But then how can a self-confessed “manager of the State for 40 years” so quickly run away from the pile of failures that he had so readily claimed to be the author? In my view, this has the looks of a man who deposits a rot so high that he is chased by the very smell of it and turns round to ask you to allow him the sanctity of your bedroom to deposit more of the dirtiness. Believe me, if anyone had slept peacefully last night, it wouldn’t be President Ernest Koroma. How could he when the very man he had hoped to use as a political umbrella is so quickly pushing him under the rain, and jamming the door on his hands? Indeed, our sad “World Best” should be anxious because we had seen many a time when an outgoing head of State had moved heaven and hell to coronate a successor only to be hunted down like a rat in a room to which rats are not welcomed. It happened in Zambia (twice), in Zimbabwe, in Ghana, in………and lest I forget……. in Sierra Leone. The founding father of this rogue red cultist party misnamed the APC, a sure Bandaylay Stevens, died a virtual prisoner in his house, broken in body and mind. Till his ignoble demise, Sheki never reconciled himself with that Dr. Oloh song which was used to eulogize the advent of Momoh TUMBA on to the State seat: “WUDAT GEE MOMOH POWER, NAR GOD; NAR GOD………….WATER WAE NAR FOR YOU OH, IH NOR GO RUN PASS YOU…”. He loathed the particular mention of God in those lines. Instead, he got a stinking kick in his face! That is always the flip side that often becomes a reality when despots try to cook the national constitution to suit their taste. It is a POISONED Plate! However, the saving grace for EBK is that he would be succeeded not by a “love turned to hate”protégée but by a very fair-minded Maada Bio who would allow the laws to work their course! And on Thursday evening, the retired brigadier Julius Maada Bio made Sierra Leoneans believe, even more deeply, that he has the knowledge, the temperament, the ability, the discipline and the determination to lead our nation to the very top of the lion mountain. That is where we will all ALL rejoice in the sparkly shine of a country blessed! Maada Bio has done us proud in the past, he has done us memorable last night, and there should be no doubt that he is perfectly prepared to do us proud again. So let us, please do our part by voting him as president of our beloved country on March 7, 2018, and crack open a new era of progress and fairness in ONE COUNTRY, ONE PEOPLE dispensation with everyone in, no one out! 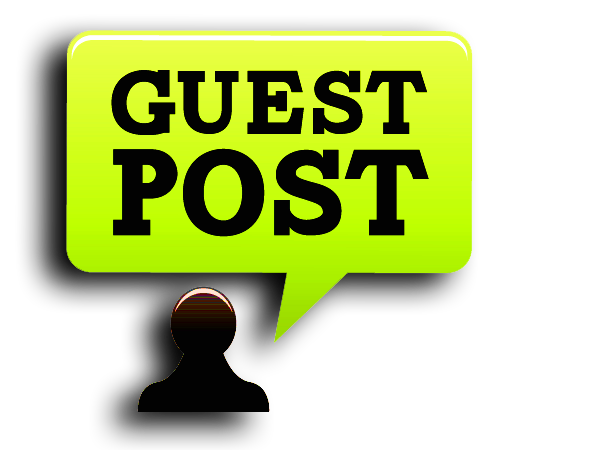 By Abdulai Braima – a London-based Sierra Leonean Social Media Commentator on current issues dealing with Social, Political and Cultural events as they unfold by the hour. 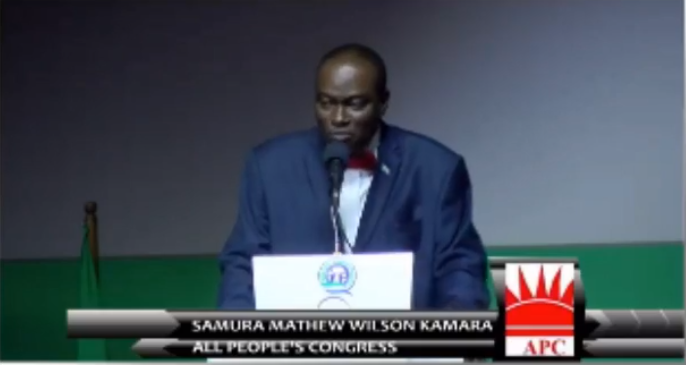 Be the first to comment on "Samura Kamara Lambasts the APC"